Nested inside a stone archway, these two double doors made of maple wood form a true arch together. Each door has been framed with two panels and each of the panels are comprised of two planks. The stiles and rails are decorated with equally spaced antique bronze rosettes. These rosettes on the mid rails and stiles where the doors meet form a cross. In the larger, lower planks, eight additional rosettes form a circle with another rosette in the center. 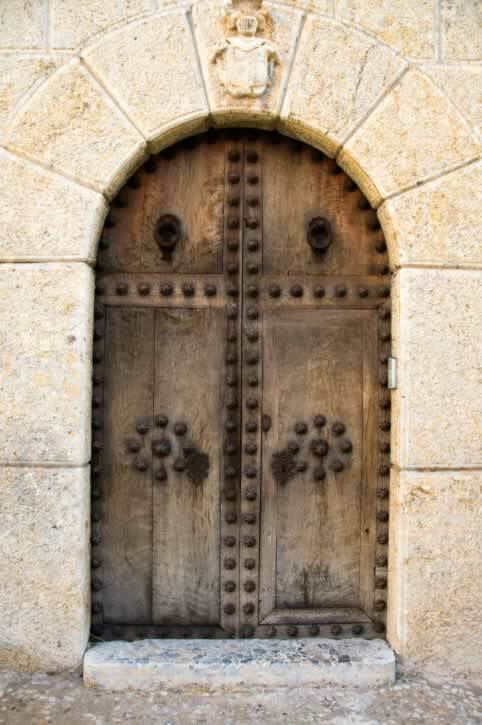 Though these doors are neither equipped with an exterior handle nor knob, each door has an antique bronze escutcheon (a type of door decoration that surrounds a key hole). In the center of the top panel of each door is an antique bronze door knocker with a ring that also doubles as a somewhat-awkward door pull because of the height of the door.